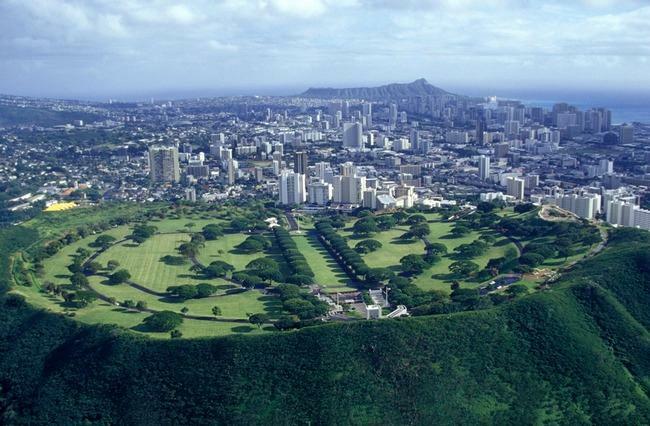 TOUR DESCRIPTION: On the Oahu Complete Island Tour, you'll see it all. Diamond Head's extinct volcanic Crater, pristine coral reefs of Kaneohe Bay, the landmark of Chinaman's Hat, the "Jurassic Park" like cliffs of the Nuuanu Rainforest, the breathtaking North Shore and Sacred Falls, the panoramic Dole Plantations, and of course the unmatched power and emotion of Pearl Harbor and the Arizona Memorial. Plus, on this tour you'll also view the 4000 foot Waianae mountain range and the rustic Leeward Coast - home to the luxurious Ko Olina resort area, Makaha Beach (where big wave surfing began), and Yokohama Bay. Experience the full range of Oahu's amazing hidden secrets, the way they should be seen.